You may purchase CDs from this site using a credit card. Your information will be processed by PayPal's secure server. If you are not already a PayPal member, you'll be asked to sign up. It's free and safe. Confirmation of your purchase will be sent via e-mail. To pay by check or money order, click here. All prices include shipping and handling fees. Taking an "adult" approach from a traditional roots rock songbook the ten original songs on Bright Screen Wide celebrates the musician's love of cinema. The recording delves into movie genres (How The West Wasn't Won), the industry itself (The Pitch), the denizens who populate Hollywood (Character,Golden Boy), iconic film figures (Lee Marvin's Eyes), the chills and spills of watching movies (The Trailer, Bigger Screen), moviemaking itself (Coming Attractions), other slightly less literal variations on the theme (Misery), and even a mini-movie scenario (Drive In). This item is sold out. For info on getting a copy, contact Mark. It's time to say, Hey! Drink Up! Ten songs that can be best described as well-crafted and hook-laden guitar pop/rock. 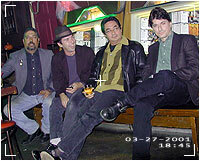 From the midtempo opener "Another Hall Of Mirrors" to the good-rockin' "Lonesome Pain," or from the pedal-steel and sax-powered "Mortican's Blues" to the sheer beauty of the acoustic "Up In The Air" -- it's always the song that matters! This item uses a different shopping cart from The Dino Club CDs. It will not be added to purchases in the cart above. This tape features six songs to whet the appetite of fans waiting for the next solo CD. It packs a range of styles: Traditional blues in "Dirty Town," the humble journey into the strange world of a "Working Man's Wage," wall of sound punk in "Hall of Mirrors," Beggar's Banquet beat in "Mean Old World" and pop rock sounds in "Valley of Love. Written up by Mike Boehm in the Los Angeles Times as the Top CD of 1995, this eclectic collection of songs ranging from the pop single "Got No Choice" to the David Lynch-esque "Lost in the Flood" to the more alternative "A Ton of Regrets" shows off Mark Cutler's songwriting talents. A "must-have" for your collection. 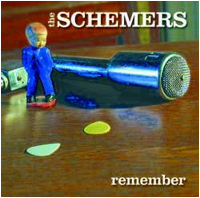 Visit Emerson Torrey's site to purchase a copy of the Schemers new CD, "Remember"